To cite: N Manoharan. 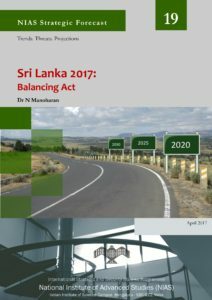 “Sri Lanka 2017: Balancing Act,” NIAS Strategic Forecast No. 19. Bangalore: International Strategic and Security Studies Programme, National Institute of Advanced Studies, April 2017. Fulfilling the above challenges, however, has not been easy. During 2016, the coalition government faced two main issues in the form of national reconciliation and economic development. About the Author: N Manoharan is Associate Professor of International Relation at Christ university.